Yesterday I bought a bunch of lemons imported from Chile (on sale, of course). So there’ll be a couple of lemon-related posts on this blog from now on. This is the PART-1: Lemon poppyseed muffins. The recipe is here. I didn’t have lemon-flavored yogurt so I used regular yogurt. Very moist and fluffy, but the lemon juice poured over the muffins at the end made them a bit too lemony for me. I should have tasted the juice before using it. 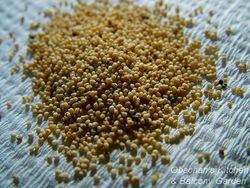 For those who are wondering: These are the poppyseeds I can get at regular supermarkets here in Kochi, Japan. I do see some black ones here and there, but the majority is "white" (well, actually it's more like beige, but you know what I mean), I guess. Are these different from what you usually use in your country? I'm curious about why you don't post or link to the recipes for the food you show. It'd be rather nice if we could give your more successful creations a try for ourselves. Thanks for your comment, but sorry, I can't understand what you mean. 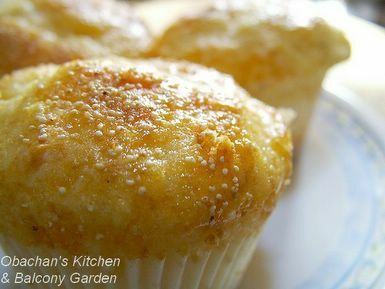 The link to this lemon poppyseed muffin recipe in this post is perfectly working on my browser. If what you want me to do is to make the recipe available, I recommend that you try a different browser or something. Or if you are complaining that I linked to the recipe when I made an unsuccessful creation, I guess you just don’t need to click on the link. It's totally up to you. What's Shari's problem? You always do a fantastic job Obachan! sounds very tart, but delicious! Anonymous: I don't have a problem. I was just wondering why she didn't post the recipes so others who read her site might try them. I didn't say this as a criticism just out of curiosity. Is this such an outlandish thing to mention? Most sites that write about cooking include their recipes. In fact, only the ones who are hoping to complie and sell cookbooks do not. I think you're the one with the problem, anonymous...making something negative out of an innocent comment. Well, even though it's tart, but still I enjoy biting the poppyseeds. I didn't say I failed. I also don't know why you wanted to mention "more successful creations" there, and to be honest, I don't care. The only thing I can say is that if the link is not working for you, I can't fix that problem for you. But I'm almost positive that you don't need to worry about other readers having the same problem. I don't think I've ever had real lemon-juice in anything "lemon poppyseed" that I've tasted. I must make this sometime -- I love citrus flavours and smells. I just added the pic of the poppyseeds I used. So are these "white poppyseeds?" This is the only kind I can get here so I didn't know if there were darker verieties. Good luck. ;) A couple of reviews said that the amount of poppyseeds in the recipe was too much, so I reduced the amount. In Germany the black poppyseeds are called "Blauhmohn" (or blue poppy) because although they are a dark color, they look a little bluish until they're hydrated. I suspect these are the same variety as the "black poppyseeds" that you and aja know.